Brazil coach Dunga blamed Portugal for what he considered negative tactics after the dismal 0-0 draw which ensured both sides reached the last 16. Hopes had been high for a display of attacking verve, but both teams tackled cynically and were booed off in Durban. 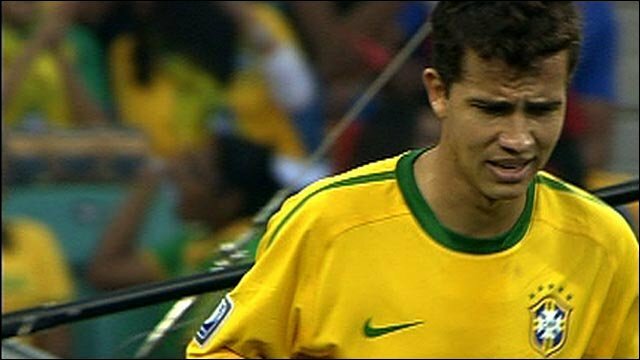 "I'm not happy," Dunga said. "We always play to win. We even tried to attack in the last five minutes. Portugal didn't attack. They just wanted to defend." Goalkeeper Julio Cesar added: "Now the hard part begins." "It was a difficult group so it was good to finish first. We can't lose anymore." Victories over North Korea and Ivory Coast in their first two Group G matches meant Brazil had already qualified for the knockout stages, though the draw confirmed them as group winners while Portugal secured the point they needed for progression. But Dunga, who has been heavily criticised by much of the nation's media for not paying heed to Brazil's traditionally vibrant attacking style of play, insisted his team possessed the greater ambition. "The Portuguese team defended from midfield backwards," he stated. "It made it difficult to penetrate their defence. We nevertheless had three or four goal-scoring opportunities." Portuguese keeper Eduardo was the chief reason for denying Brazil when they did break forward, brilliantly tipping Nilmar's close-range effort onto the post in the first half before clawing the ball away from his top corner from Ramires' deflected strike late on. Real Madrid forward Kaka was suspended and midfielder Elano missing through injury, but Dunga said their absence did not hinder his side. "Kaka and Elano are exceptional players," the Brazil boss reflected. "But the way in which Portugal played, it would have made it difficult for Kaka and Elano to help us more." When asked about the many fouls which littered a match in which seven yellow cards were produced, Brazil captain Lucio replied: "We know both teams had a lot of will to win and went in with a lot of determination and so it happens, one or more severe tackles. "I think our team tried to play a little more. We knew it would be like that as both teams were qualified."